Looking at the details, inflation has come way down from the peaks of 20 percent of only a few years ago and banks have started to increase lending and credits to corporations (interest rates are however still higher compared to regional neighbors). 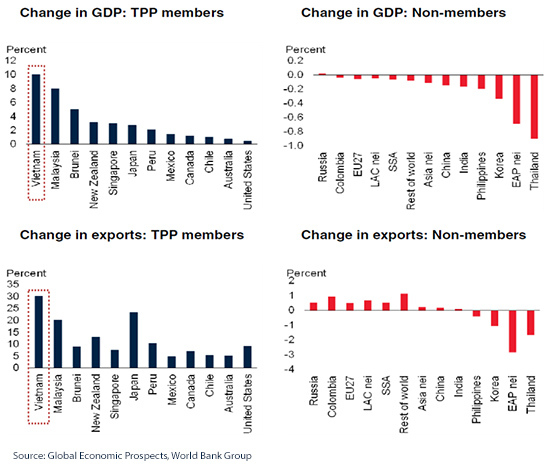 Trade balance is positive (not with China though!) and the Dong has been one of the most stable currencies in Asia over the past two years. We have seen a mild depreciation following the downward movement of the Chinese Yuan but looking forward the projection is for the currency to be rather immune from wild yo-yoing in either direction. One of the concerns is certainly going to be the management of higher budget deficits due to the absorption of SOE’s bad debts, weak oil prices (Vietnam is a major oil producer) and much needed infrastructure spending across the country. The government has done a good job at stabilizing the runaway inflation and is pushing ahead in opening up the SOE’s sector to foreign participation and internal restructuring. Additionally, since the geo-politically triggered incidents of two years ago (when angry local Vietnamese workers created havoc and damaged several Chinese-run factories following the installment of an oil rig in a disputed part of the South China Sea by China) we have not seen any major disruption or similar situations affecting foreign investor’s sentiments. Tourism is perhaps the only sector which was affected by what happened back then but the recent easing of landing visas, work permit applications and an increased number of flights from and into the country should shine a positive light back on the touristic sector and the employment of foreign nationals in the country. Vietnam boasts the second youngest population in Asia and one of the lowest levels of urbanization which should also positively affect the labor and real estate markets with more and more youngsters willing to move to the bigger cities. If we look at the Foreign Direct Investment (FDI) sphere, numbers in the first two months of 2016 were very encouraging with an 80 percent jump in foreign direct investment compared to the same period of last year. Of much interest is the fact that the newcomers counted for over 70 percent of the total figure represented by the manufacturing sector, which shows strong indication that Vietnam is indeed being looked at as the new manufacturing hub for Asia. As mentioned at the beginning, one of the main reasons appealing to international businessmen to establish operations in the country is the current and future economic impetus following the signing of many recent free trade agreements with western countries. Vietnam is well placed at the “center” of the intersection of many important free trade deals which will contribute greatly to increasing Vietnam’s GDP as well as exports in the years ahead. 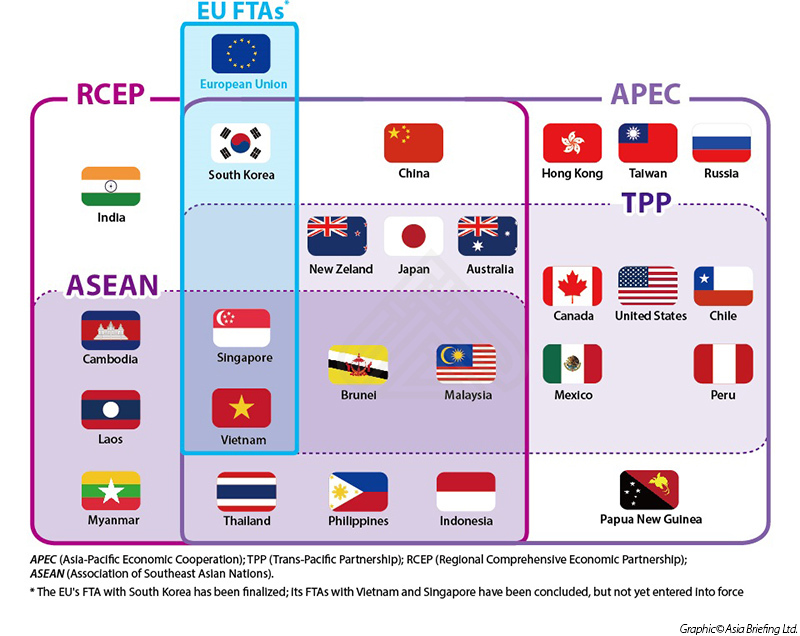 The latest additions to the “spaghetti bowl” of FTAs to which Vietnam is signatory to were the EU-Vietnam FTA and the TPP. For more related news on the subject please click here. The country is now in the enviable position of having signed free trade deals with the major economic blocks of the world including the US and Canada, the EU and also the Russian Federation via a further agreement with the Eurasian Economic Union. Many studies have been done on the economic benefits arising from such a privileged position and I feel the most accurate one (albeit only in relation to TPP) is the recent report Global Economic Prospects by the World Bank Group which highlights the fact that Vietnam (and Malaysia) would be amongst the TPP member countries benefiting the most from the inking of the deal. It is projected that the Vietnamese economy will add (just because of the TPP) a 10 percent gain in GDP and a 30 percent in additional export value up to the year 2030. If we add up the benefits brought by the other FTAs and the fact that now Vietnam is also moving ahead out of its own steam, we can forecast an annualized GDP increase of seven percent and above for the next several years at least. Obviously, looking at the crystal ball is no easy job and the variables affecting the Vietnam’s economic performance are many but we are indeed bullish on the Vietnamese economy from both what we read and write, but above all from what we see every day on the ground. The TPP and the EU VFTAs are not just about tariffs reduction, far from it. The advantages in term of customs duties coming down will “only” add less than 15 percent to the overall projected value contribution to the Vietnamese economy. More strategically, both agreements will open up many restricted sectors under a negative list approach (which basically means that if your projected activities are not on such a list then you are free to carry out your business in the country), eliminate most non-tariff-barriers, promote a levelled playing fields while competing with SOEs as well as allow for fairer and more transparent biddings in government procurement contracts (estimated to be over 2 trillion USD in TPP countries). Intellectual property enforcement will be swifter and offer more guarantees to foreign businessmen as well as local players, dispute settlement provisions will also be improved allowing the use of international arbitration institutions to facilitate legal dispute resolution and conciliation between international investors. This is all great news for American and European companies about to plant a flag in the country. We have previously highlighted the requirements in order to benefit from the reduced tariffs as part of the agreements in our article “Understanding Vietnams Tariff Reductions”. What about Vietnam’s competitors? Due to shrinking market access and greater competition in export markets, Korea, Thailand as well as Cambodia, Laos, Myanmar and the Rest of South East Asia (EAP in the graphs below) could suffer some set-backs. Having said that, some of these Asian economies have also shown interests in joining the TPP in the near future. Note: “LAC nei” includes Argentina, Bolivia, Brazil, Costa Rica, Ecuador, Guatemala, Honduras, Rest of the Caribbean, Nicaragua, Panama, Rest of Central America, Paraguay, El Salvador, Uruguay, Venezuela RB, Resto of North America, Rest of South America. “Asia nei” includes Bangladesh, Kazakhstan, Kyrgyz Republic, Mongolia, Nepal, Pakistan, Resto of South Asia, Rest of Former Soviet Union, Rest of Western Asia, Sir Lanka. “EAP nei” covers Cambodia, Lao PDR, and Resto of Southeast Asia. “SSA” indicates Sub-Sharan Africa. Let’s not forget about the other FTAs Vietnam is signatory to and especially the ASEAN – PR China FTA which already is the biggest free trade zone in term of population (1.8 billion people) and the third in terms of economic importance after the EU and NAFTA. Our overview on how the ASEAN-China FTA affects foreign investors in both countries can be seen here. We have seen a growing number of clients trying to expand their outreach into ASEAN from their manufacturing platforms in China and this trend will continue in the years ahead due to the increasing share of ASEAN in global sales and consumption as well as to the improving logistic and infrastructure developments. Another important factor is the progressive reduction of cross border tariffs till 2018 when all interested countries shall eliminate tariffs for all the products placed under normal track arrangements. We are also assisting an increasing number of larger clients in Asia with international operations looking at how to better structure their supply chain in the region. This could enable them to benefit by the different tariffs reductions applicable to different countries, both on the sourcing of components and raw material side and on the final destination of the end products. Interestingly, “tariffs engineering” is a new subject (and role) being created by the consolidation of supply chains and the benefits (or obstacles) posed by new free trade deals developing in Asia and globally. Many of our reports are prepared for clients looking at the advantages and disadvantages of moving certain manufacturing or sourcing activities to selected locations. These must take into consideration rule of origin requirements as well as progressive custom reductions. Manufacturing is at the top of the list. In 2015, while China attracted more service-oriented enterprises than manufacturers for the first year in its recent economic history, Vietnam’s production-oriented companies represented the lion’s share (at almost 70 percent of total FDIs) in the country. Vietnam has developed a well-deserved reputation as an alternative or addition to China in various sectors. Whilst it is true that the attractiveness of lower-value production is apparent (in term of cost of labor, land, tax incentives and free trade agreements), high value and high-tech operations are also taking shape in the country, spearheaded by some big names like Samsung, Intel and other Fortune 500 MNCs. High-tech goods’ share of total exports rose to 25 percent in 2015 (from five percent in 2010), indicating a major shift in industrial production taking place. The change is largely triggered by newer and larger South Korean, Japanese and Taiwanese investments. Advanced manufacturing is indeed starting to trickle out of China to Vietnam, Thailand and Malaysia. Even if no one country, at least in the medium term, will replace China as the “factory of Asia,” it is interesting to note how the supply chain is moving across countries and morphing the local business environment accordingly. Within the manufacturing sector, we have seen strong movements in the textile, apparel, garments (including upstream production of fiber and yarns required by the most recent FTAs’ rule of origin requirements) and related supply chain sectors, as well as in plastic components and accessories. With so many textile and apparel companies eyeing Vietnam, having a proven testing and laboratory testing provider is of paramount importance to ensure that imported raw materials and fibers (in most cases from China) fulfill quality standards. Testing could also include quality control and other necessary services to ensure the fulfillment of specifications and standards, and could span well beyond textile and apparel sectors. The Vietnamese government has been adamant in pushing forward with the restructuring of its SOE sector. This means foreign participation in opening up and upgrading the sector is welcome in most industries and categories. SOEs are also undergoing consolidation in order to create “local champions” that are well equipped to fend off increasing competition from foreign players following FTA implementation. While the pace at which this reform is taking place is debatable and has recently lost momentum, there are still enormous opportunities for VCs, PE firms, and savvy international investors to tap into a growing market. Vietnam is the second largest exporter of coffee and rice in the world, and also a top global exporter of rubber, cashews, peppers and seafood. These sectors require further investment into technology and modernization, and most of them are open to foreign players’ participation. With the liberalization and tariff reductions following recent FTAs, these sectors will attract many investors looking at expanding capacity or tap into new markets. The Vietnamese middle class is growing, and with it, an increasing appetite for Western luxury items is permeating the society. We have seen a plethora of top international brands entering the market in order to obtain a first-mover advantage and create brand awareness in the 13th largest country in the world with a young and Westernized population. E-commerce and e-tailing are also taking shape in the country following a surge in smart-phone penetration. With increasing numbers of foreign brands entering the market to manufacture or source locally, the need for logistics providers is on the rise. Vietnam is catching up fast with infrastructure and international connections. Shipping lines are opening up new direct routes without forcing exporters to trans-ship in Hong Kong, Singapore or Bangkok. Internal transportation, warehouse management, pick & pack activities and general logistic support still fall short of the growing demand. As mentioned before, one of the most important targets of the Vietnamese government is the well-being and improvement of the work force. Vocational schools, training centers and more general educational programs are in great demand. Young Vietnamese are hungry to learn and very dedicated to furthering their studies. Since mid-2015, the Vietnamese real estate market has welcomed a growing number of foreign investors. Private funds, PE funds and institutional investors are expanding their asset portfolios in the country after several years of market freeze. The RE market seems to have bottomed out, and while there will still be many new residential (and commercial) offerings in HCMC and Hanoi over the next two years, many good bargains are now up for grabs. The Vietnamese government has recently liberalized its housing laws regarding property ownership by foreigners. Foreigners entering Vietnam with valid entry visas will be able to acquire a 50-year leasehold tenure (extendable). Many firms operating in Asia would agree that challenges are always around the corner. 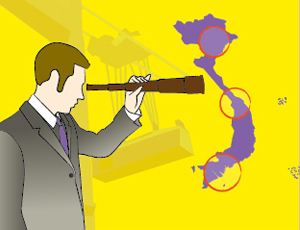 What could go wrong in Vietnam and consequently affect future FDI? One of the main reasons for setting up shop in this country is its competitive cost of labor. This is still the case (especially when compared to China, Malaysia and Thailand), but things are changing fast and an annual increase in the range of 8-12 percent can be expected in the years ahead. The fact that Vietnam is attracting high tech MNCs also adds pressure to SMEs’ retention rates, as employees might be lured away by larger, more sophisticated and well-established international companies and brands. Staff turnover will be a major concern going forward. While many companies are coming to Vietnam, the supply chain localization rate is far from adequate across various sectors. Only the motorcycle industry can boast a localization rate of more than 90 percent. Other sectors are still relying heavily on components and raw material imports from abroad, so investment in the country (and related ROI) will have to be considered over a longer period of time. Second, third and fourth tier suppliers are coming, but it will take some time before a fully integrated supply chain is established in the country. This might push up the cost of operations, at least initially. We are also concerned about the social divide which is brewing in the country, as the wealth and investment gap between urban and rural regions is growing with each passing day. If we add to this, the number of people who might lose their jobs as a result of SOE restructuring and consolidation may increase. We can see that the government must ensure that the economy is functioning properly to create new jobs and opportunities. At the same time, improvement in education and health care is of paramount importance to ensure that a larger portion of the population can reap the economic benefits and prosperity of a country which is, slowly but surely, opening up to the outside world. The pace at which this is happening is not in line with what the market and labor pool require. Vietnam is opening up its economy and thus bringing down tariff and non-tariff barriers with a multitude of countries, both within Asia and globally. Such opening up would also make neighboring countries’ products more readily available to final consumers in Vietnam. This could pose a challenge to the still embryonal Vietnamese agricultural sector, which will be under a lot of pressure from qualitatively superior and likely cheaper imports from other FTA member states. On the positive side, FDIs in virtually all sectors are badly needed for reaching the country’s economic goals. The Vietnamese government does not have the money or expertise to invest in upgrading the economy on its own and to the extent it needs in such a short period of time. Compared to China, where business is getting tougher and more competitive for foreign companies, we can still expect the red carpet in Vietnam to be fully rolled out in the years ahead. In this issue of Vietnam Briefing magazine, we discuss the key aspects of Vietnam’s import and export landscape, focusing on textiles, telephones and computer products, and automotive parts. We then analyze opportunities for Vietnam among its inclusion in multilateral regional trade blocs, before examining the European Union-Vietnam Free Trade Agreement in detail. 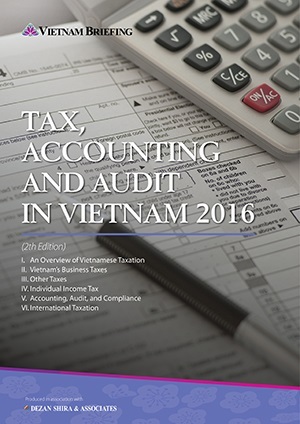 Finally, we give an overview of the requirements for establishing a trading company in Vietnam.